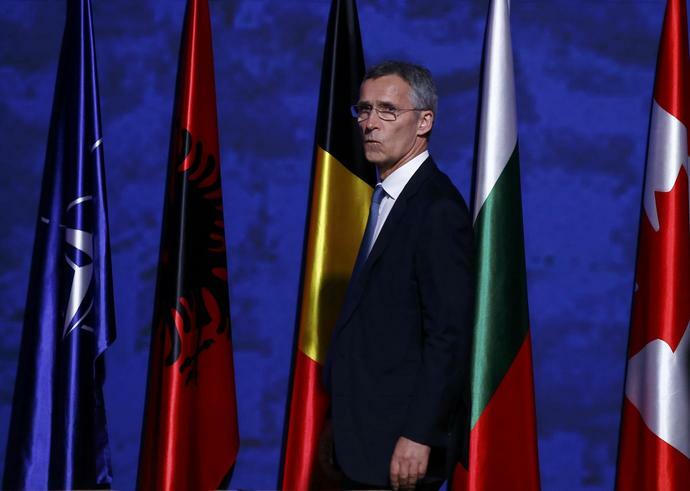 The NATO Summit that wrapped up in Warsaw over the weekend did so in historic terms. The official decision to station four battalions in former Soviet states to counter modern Russian aggression was hailed as "21st-century deterrence and defense in the face of 21st-century challenges" by NATO Secretary General Jens Stoltenberg. "We're moving forward with the most significant reinforcement of collective defense [at] any time since the cold war," said President Obama. But even as plans were made to bolster NATO's eastern flank amid a military buildup on the Russian side, leaders and experts said both NATO and Russia must now quickly dial back tensions - through constant communication, transparency, and by finding common ground on issues that each finds threatening. Now, eyes will turn to the NATO-Russia Council called for Wednesday. Dmitri Trenin, director of the Moscow Center for the Carnegie Endowment for International Peace, distinguishes between any threat, which he says is misunderstood because it is wrongly viewed through the prism of the cold war, and risk, which is growing daily. "We are living in a period of enormous risk," he says. The weekend's decision to deploy a rotating force of four battalions - led by American, German, Canadian, and British forces - in Poland and the three Baltic states was expected. But Moscow regards the move as a violation of NATO's earlier commitments not to station permanent foreign forces in those territories. While the move technically dodges that definition, the forces will permanently rotate by next year for as long as is needed, Mr. Stoltenberg said. Marcin Terlikowski, an expert at the Polish Institute of International Affairs, which organized a two-day forum on the sidelines of the NATO Summit, said that the West's response could grow if the threat does. "If we see an escalation, further measures will be needed," he says. It's a game-changer for those who have sought more assurance from NATO against Russian advances since the annexation of Crimea in 2014. Michal Baranowski, director of the German Marshall Fund of the US in Warsaw, says that this "tripwire strategy" creates "a very different calculus" - amounting to the difference between stirring up regional problems with Estonians or Poles, and automatically bringing in the British, Germans, Canadians, and Americans. But an urgent need for dialogue has become clear, says Thomas Gomart, director of the French Institute of International Relations. "We should keep all the channels open to avoid misunderstanding and miscalculation. The current situation is highly volatile." The NATO-Russia Council is meeting for the second time since April - a sign of the priority on rapprochement on both sides, observers say. NATO canceled such cooperation after the annexation of Crimea, while Russia, had it wanted to protest the outcome of the NATO Summit, could easily have postponed it. "The resumption of direct meetings is an optimistic sign," says Pavel Zolotaryev, deputy director of the official Institute of USA-Canada Studies in Moscow. "The council was created to prevent misunderstandings, but it was used as an instrument for pressure on Russia when its meetings were halted." There are other indications that cooler heads are prevailing, including signals that the US and Russia are discussing a higher level of coordination in Syria's bitter civil war. Last month Russia and Turkey also moved to quell their dispute over the Turkish downing of a Russian bomber in Syria last November. In the run-up to the NATO summit, Russia suggested several measures that could ease the dangerous military buildup, especially in the crowded Baltic theater. On a visit to Finland 10 days ago, Russian President Vladimir Putin suggested an agreement could be reached to require all military aircraft flying over the Baltics to switch on their transponders, which broadcast identity and position. Russian Defense Minister Sergei Shoigu last week ordered the military to establish new rules for carrying out maneuvers near NATO forces. Speaking to the Moscow daily Kommersant, Russian permanent representative to NATO Alexander Grushko said Russia would be willing to update a relevant 1972 agreement. Discussions could include "the minimum-allowed distances between ships and aircraft in the same area, establishing special radio frequencies for them to communicate, and so on. There could be a package of measures which would enable more efficient operations and better understanding of each others' maneuvers amid such encounters," Mr. Grushko said. This is a relief to some observers. "While we don't see any clear trend on either side that would point the way out of this crisis, the potential is there for reasonable leaders who see the dangers can stop this cycle of escalation," says Alexander Konovalov, president of the independent Institute of Strategic Assessments in Moscow. "Both sides have political and economic limitations that should rein in enthusiasm for any new cold war." Andrey Kortunov, director general of the Russian International Affairs Council, says that the two sides should come together on the issues from Iran to North Korea. That would "force the two sides to put aside contradictions and disagreements and unite them in a joint fight," he says. Mr. Gomart calls for similar cooperation on terrorism. "No European security is possible without Russia," he says. So far the response to the summit in Russia hasn't been as acrimonious as expected. Russians are buoyed by what they see as some divisions in NATO, including from members who care more about the security threat on NATO's southern flank from terrorism and wars in the Middle East. While only part of a broader strategy, the Polish-Baltic battalions are also dwarfed by the Russian buildup, and represent an insignificant menace in military terms, says Christopher Chivvis, associate director at RAND's International Security and Defense Policy Center. In that sense, no bluster from Russia should be taken at face value. "You have to differentiate between what Russia is going to say … and what Russia actually thinks," he says. The potential for misunderstandings remains high. Viktor Litovkin, military editor of the official ITAR-Tass news agency, says that NATO is overwhelmingly superior to Russia in every key measure, including population, economic power, and military force, making idea of Russia as a big new threat to Europe "preposterous." "The US wants to drag us into a new arms race, as they did before, in order to bankrupt us through military spending," he says. "But we won't do that. Russia will counter NATO in smart ways, whatever is needed to defend ourselves, but not more." Dr. Trenin agrees the West has the clear upper hand by almost any measure. Russia is simply trying to "keep it even," he says, but that could entail risky and rash moves. At the same time, during the cold war, the West detested communism but respected the Soviet Union. Today there is no respect, he says. Trenin doesn't even see a clear agenda from either side, "which makes it even more [unacceptable] that we can stumble into some place that no one wants to be."